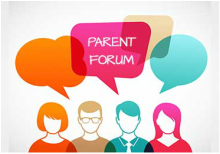 Please be aware that this Forum is intended to be a useful tool to allow parents to communicate about matters relating to school only. The forum is not to be used as a place to share complaints or voice negative opinions. If matters like that should arise then please feel free to contact the relevant member of staff. Any inappropriate comments or posts will be removed immediately and membership will be revoked. Please remember this forum is public! Please feel free to use this forum to discuss anything relating to school. - You have to sign in using an e-mail account to post anything. - Everything written becomes public, please treat this with respect. - Please do not use the names of any children in your comments.